By Dan Mekinec on 16. May 2018. Here’s a tough question: what’s the one thing you absolutely need to make it big in affiliate marketing? Luckily, we’re here to help you out. 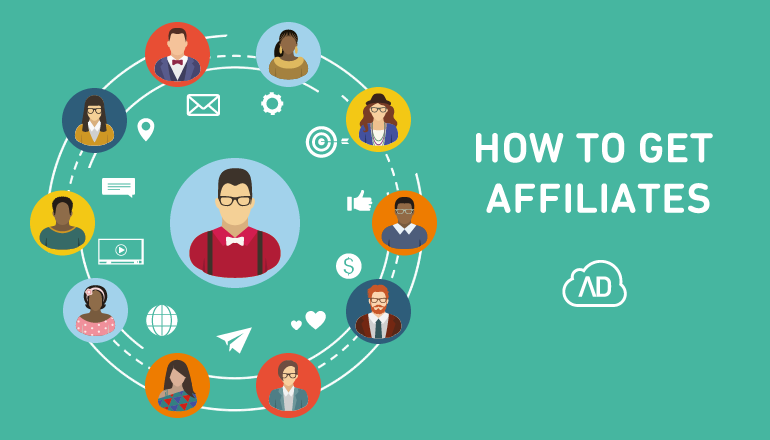 Whether you’re just starting out, or you’ve been doing this for some time, but you’re stuck with underachievers, the conclusion is the same: attracting new affiliates is a must, if you want to promote your products or services even better. Here’s a few ways how you can get more to join your program. Of course, you can combine all of them for maximum effect! As you know, everything revolves around networking – making new (business) friends. So, the first and probably easiest step to take would be to join an affiliate network. If you’re not familiar with one of the essential affiliate marketing terms, affiliate networks act as intermediaries between affiliates (or publishers) and advertisers. Advertisers offering affiliate programs join affiliate networks to reach larger audiences, which would be all the publishers in the network. Of course, the same goes for the other way around – publishers look for advertisers who are suitable for the content they produce. So, joining an affiliate network is in both publishers’ and advertisers’ interest! ShareASale, ClickBank, Amazon Associates and IMOCASH are just some examples of networks you can check out. Nothing beats a good ol’ fashioned telephone… OK, maybe you can’t always phone people directly, but you can at least send e-mails, right? So, we’re assuming you have already done an extensive search of a niche or subject. In case you didn’t, it would be wise to do exactly that, focusing on organic keywords related to your product or offer. Finding influencers in your niche is also one of the most effective practices. Also, don’t forget to scan related groups on Facebook, LinkedIn or other social media, explore Twitter hashtags, or to comb through Quora and other similar forums. If you have the chance, make an effort to reach people at conferences, summits, meetups and other whatchamacallit industry events. Since you’re at it, why not go through your circle of friends and acquaintances, maybe they have their own blogs or websites? Find as much email addresses as you can and add all that contact info into one big email list! When looking for programs or networks to join, affiliates usually search for options on the web first. Want people to find you, but don’t really want to pay for ads? Optimize your website for organic searches. It will take time and effort for you to make a name for yourself and move up the rankings, but sadly, there’s no recipe on how to get affiliates without putting in any amount of work (or money). If optimizing for search engines is too much of a hassle, you can always pay to have your ads immediately appear at the top of related searches (or news feeds). Even though advertising models like pay per click may have more immediate results in finding an audience, it doesn’t mean you don’t have to have relevant and updated content. Meaning, even if people click on your ad, few will want to do business with someone who has an outdated and unkempt landing page. That’s just unprofessional. Here’s how to make your landing page shine! Let’s say you’ve done a good job of finding some potential recruits. Wouldn’t you like to select the best ones and then keep them from running to your competitors? In that case, let’s see how you can use it our Affiliate Software as an affiliate recruitment tool. We assume that not every affiliate will perform equally well, so you may want to separate the wheat from the chaff… While that may have sounded too harsh, the reality is that only a small number of affiliates will most likely make up most of the traffic. You probably want those who work the hardest, right? By customizing affiliate applications during recruitment, you can define which kinds you’re looking for, and filter out the good, bad and the ugly. Add your own questions to the application, and choose whether you want to automatically include some that meet your terms, or to do it manually. 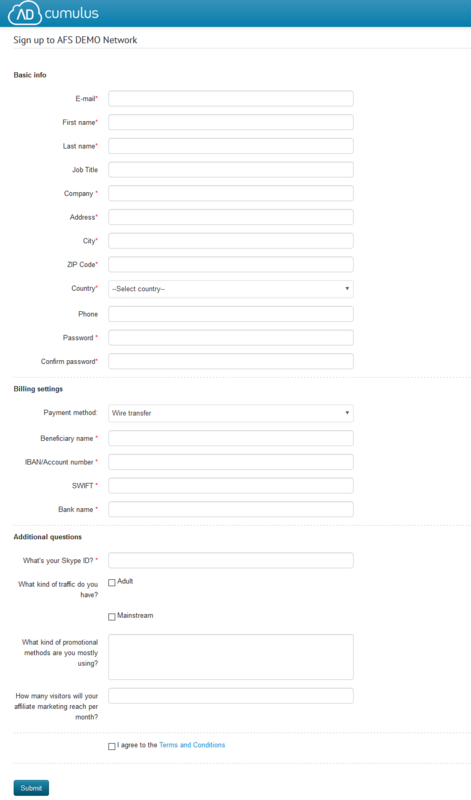 An example of a customized affiliate application. It’s sort of like a job interview! Good communication is the crucial ingredient in every relationship. How about having an integrated e-mail tool to contact people about your offers, and to easily keep in touch afterwards? You bet Affiliate Software has it, as well as lots of other options for customizing. Check out more affiliate settings here. What do affiliates really want? Why are they into affiliate marketing in the first place, and what do they expect to get out of it? Of course, it’s all about thing: money. You can keep cash flow regular and fair by customizing credit notes in Affiliate Software. What better way to build long-lasting partnerships? Like we mentioned above, communication is key, and you know money talks. Maybe you would like to witness the Affiliate Software in action first? No problem, you can request a free demo and try all these options first-hand. And that concludes our today’s read on how to get affiliates. Got more questions? We’d love to hear from you!